Genesis is an advanced, fast, flexible and secure WordPress theme framework from StudioPress with lots of great turn-key designs (child themes) available for it. The Genesis Theme Framework is essentially a core WordPress theme that is highly optimized with state of the art code and smart design architecture. It has a mobile responsive design and also includes convenient inbuilt layout, design and SEO options. The theme has been fully search optimized, and the clean, efficient code ensures your website and its content will achieve the best possible rankings in the search engines. Genesis also follows all WordPress security best practices and is audited by the WordPress Lead Developer to ensure it has the best security possible. The Genesis theme can be used as is for a clean minimalist website, or extended with the many beautiful child themes (designs) available for a sleek professional look without paying a fortune (see examples below). Using a framework / child theme system is smart from a “future proofing” and SEO perspective because you can radically change the look of your site, every week if you want to, and you’ll never lose your content or hurt your search engine rankings because the design is kept completely separate from the core theme framework code. Genesis also makes it easy to customise and manage your site with lots of inbuilt features such as mix-and-match layout options for individual pages or posts, custom widgets, automatic framework updates, comprehensive theme options panel, custom widgets and much more. When selecting a WordPress theme framework (or any theme for that matter) it’s important to choose one you know has been built by a developer or company you can trust, and is high quality. StudioPress is the pioneer ‘premium WordPress theme’ company and has been creating top quality products since 2007. Many top websites choose to build on Genesis and you can be sure it’s an optimized, secure and flexible foundation for your website you can trust. Genesis is fantastic value because StudioPress gives you unlimited everything in the onetime purchase price. They provide unlimited support, updates, and domains you can built which makes for unparalleled value. 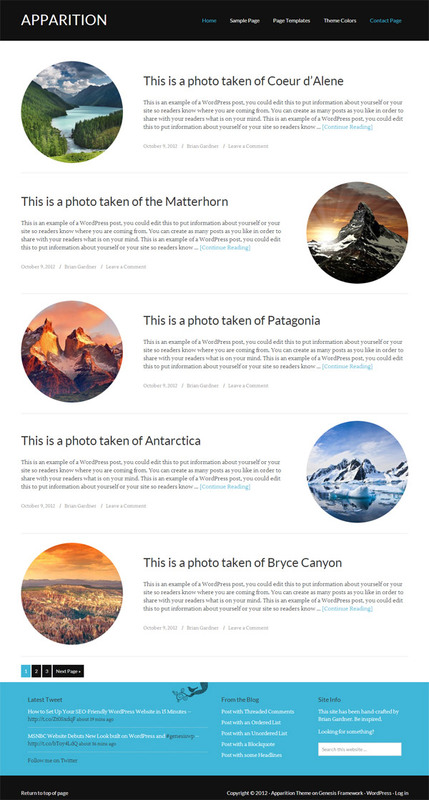 StudioPress have more than 45 child theme designs available for the Genesis Framework such as ones below. 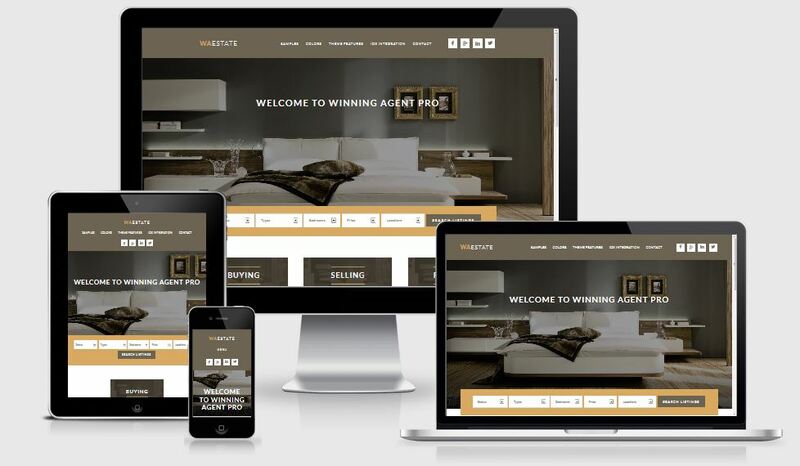 Revolutionize your online presence with the Winning Agent Pro theme – built to bring clients together with their agents. Build your own personal brand and look great in the process. Winning Agent is perfect for showing off your personality, your community, and your real estate listings. Foodie is a Genesis child WordPress theme designed and developed by Shay Bocks listed on StudioPress store. Foodie theme consist of three color schemes which are Earthy, Citrus and Minimal and these are the best color sets to improve look of your food blogging site. The food recipe writers will find this StudioPress genesis child theme very suitable to easily post recipe articles using advanced features given with recipe card styling. The website loads smoothly when user navigates from one post to other post and maintains same performance even while browsing picture gallery or videos. This is the reason why this food blogging theme has gain great acceptability. The 411 Pro is a responsive child WordPress theme from StudioPress developer club. Parent theme “Genesis Framework” should be installed to work child theme. This theme is designed with clean approach, bold fonts, and custom background images to bring your valuable content to the world with well-optimized code. 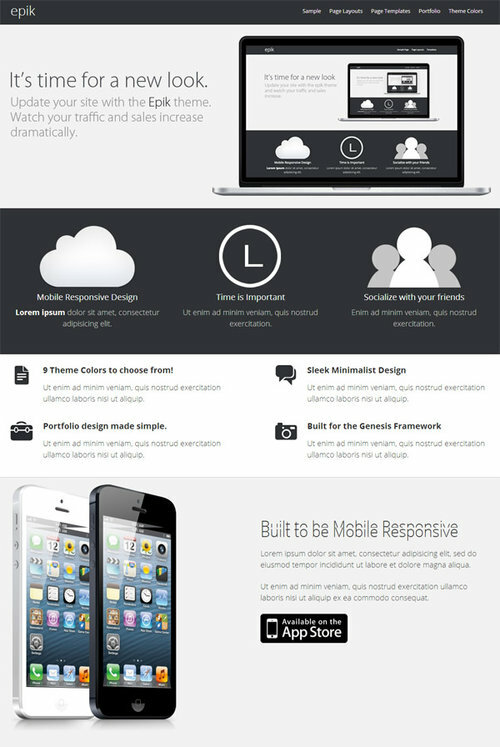 Since it is a responsive layout, it will support on all smartphone and tablet pc devices. 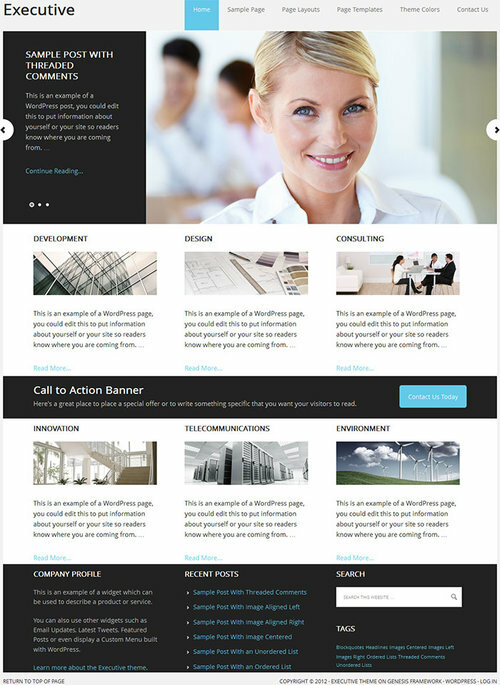 The 411 Pro theme has been designed for HTML5 markup and Google schema support. It has come with plenty of features like custom post formats of quotes, links, videos, mp3 and etc. There are also some pre-built page templates for archive, columns and landing page. The demo contact forum has been used by Gravity Forms, which is a 3rd party plugin. The social media widgets are another additional to this theme! Overall “The 411 Pro” would be great choice to use for personal, freelancers, travellers, portfolio, photographers and anything that you feel, it can be used it. 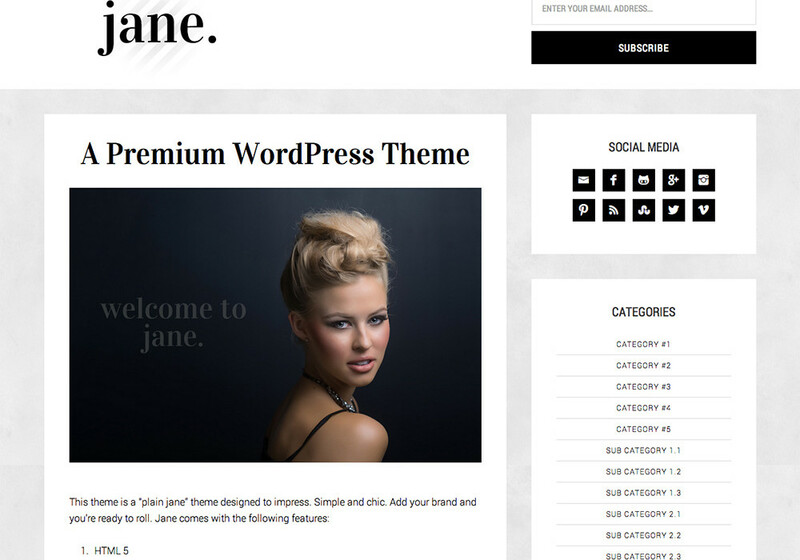 The Jane Theme is one of the most elegant looking and simple looking premium WordPress theme. It’s a studiopress child theme created by a company called Pretty Darn Cute Design. It’s actually a perfect theme for fashion blogger because it has a certain style and elegance to it. It’s a completely mobile responsive theme which means that it will open with the same grace on mobile devices like smartphones and tablets. With 5 color styles and 6 layout it provides you with a variety of customization options and to make it look as the way you want. Modern Blogger is a premium WordPress Blog theme with a creative and colorful design that is sure to make your blog stand out from the pack. 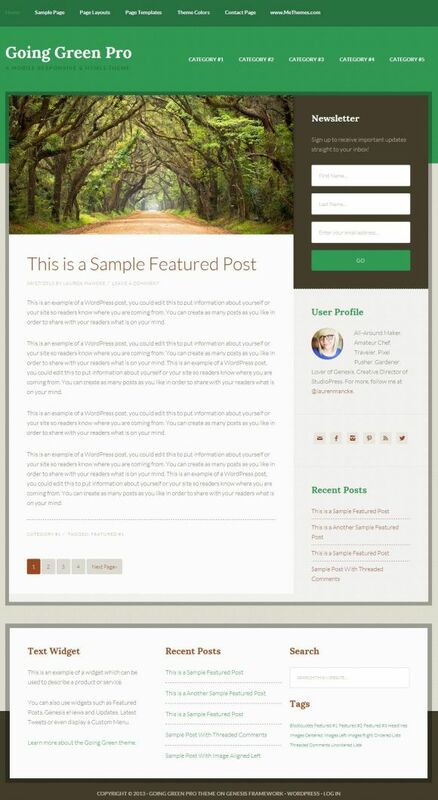 Modern Blogger is a child theme for the great Genesis Framework, and the price includes the framework. Modern Blogger includes 6 layout options, custom background options, custom header options, featured images, fixed width, theme options, threaded comments and much more. As a child theme for the Genesis Framework, much of the power of the theme is seen in the underlying framework, which lets you easily customize nearly all aspects of your website through the WordPress admin backend. While Themespotter is mainly focused on finding and showcasing WordPress business themes, we also like to feature the best premium WordPress blog themes. While this theme’s artsy background and color scheme do narrow down the types of blogs this theme would be good for, I like the creativity of it. It seems like a great option for individual blogs, photo blogs and travel blogs looking to stand out from the crowd. 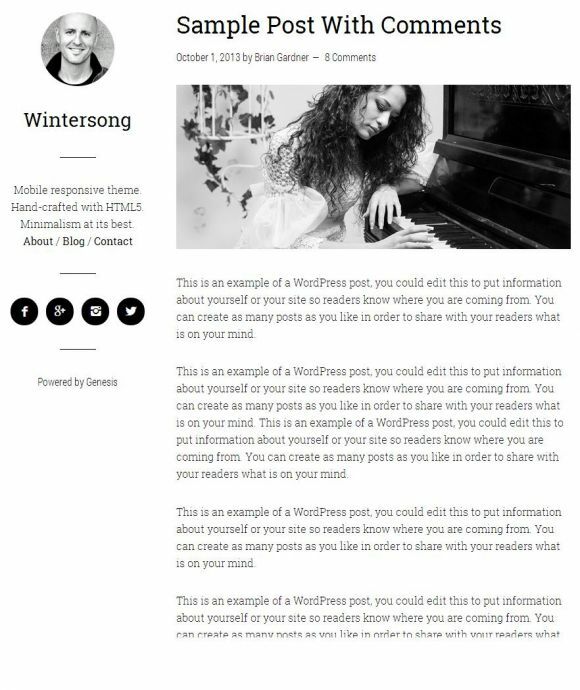 Wintersong is a super minimalist, responsive blog WordPress theme. 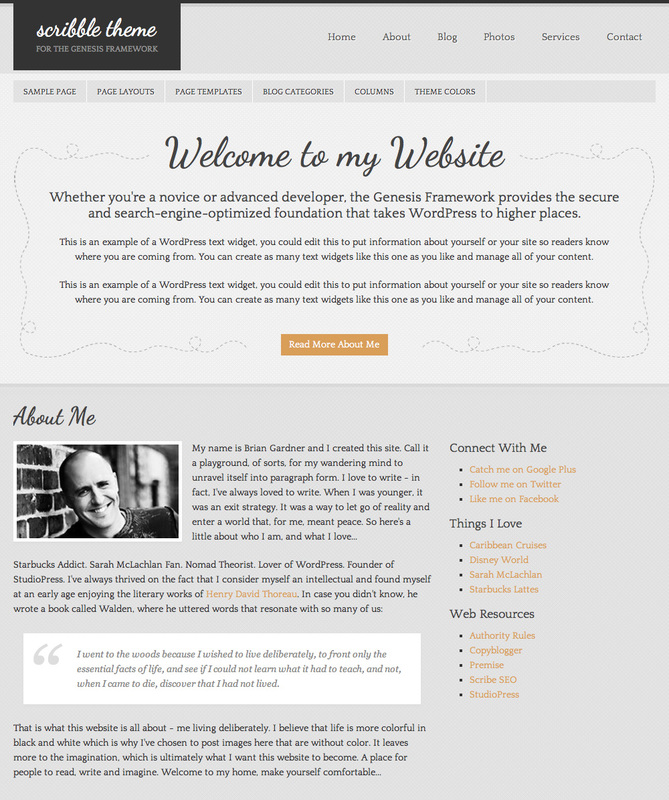 The child theme is extremely simple and minimalist ensuring your words and content stand out. Its mobile friendly with a responsive design and has a fixed left sidebar and single column for your content. Some of the other features of the Wintersong theme include: custom header and menus, HTML5 markup, a landing page template, theme options, and the other benefits of the Genesis framework – which is really the main reason you would buy this theme. Sixteen Nine Pro by StudioPress is a beautiful HTML 5 powered genesis child theme which let’s your text shine through professional look. The theme has black and white shining colors with quality fonts to make a blogging website where readers can enjoy every single word white reading through articles. The best target of the theme are bloggers, information providers, technology advisers etc. The unique design section of the theme is sticky type header displayed as left sidebar, this sidebar stays fixed and visible when you scroll through the homepage feature posts or scrolling through individual long articles. If won’t be much hard to add buttons, videos or images to explain your words with the multimedia support. Pretty Pictures is a premium photo blog theme with a simple yet distinctive layout that places the focus squarely on your photographic talents. The theme has a single column with no sidebars, and a mobile responsive layout which will automatically adjust for all screen sizes and resolutions so it works perfectly on iPads, iPhones and all other mobile devices. While being sold as a photo blog theme, it could also be used as a clean, distraction free blog theme that focuses on your writing. Some of the other features include custom header, custom menus, featured images, theme options and more. Pretty Pictures is a child theme for Genesis Framework so includes all the other features and benefits of this solid, highly optimized WordPress theme framework. Stretch Theme is a simple, beautiful theme that has a hint of old-school classic blogging with emphasis on content, with a very contemporary mobile responsive design (it automatically adjusts screen sizes to fit mobile devices just as beautifully as laptops and desktops). You’ll see a full screen background image for each of your posts (that you choose of course) that adds an extra bit of life to your content. Yes, I love this new release. The theme features 6 color styles, custom menus, featured images, fixed width, is mobile responsive, and has other theme options. Sometimes I long for more simplicity in websites. I know from experience that many people are looking (and not finding) themes like this. What a great way for you to have your audience breathe for a minute and read. And like I said, that background image gives you an chance to highlight some important aspect of your story. Runway WordPress Theme is a responsive fashion bloggers premium WordPress theme design by StudioPress. This theme has created content and images showcase with clean and minimal design. Runway WordPress Theme has features like clean and simple homepage design, fully responsive layout, featured post slider on homepage, featured post display on homepage with thumbnail style, homepage with sidebar integration, social network integration, built in sticky menu, 8 theme color schemes, 2 types posts page layout, comprehensive documentation guide and theme support, theme admin option panel and more. Crave WordPress Theme is stylish magazine and blog theme especially made for food blogs, by StudioPress. Crave Theme is made for food related contents, it will support you to create media oriented contents to display your food dishes and recipes in royal style. The homepage design solely depends on how you will choose to add widgets and other elements to create your custom looking homepage. If you look on the demo page you will see a menu-bar on the top most location of the theme, besides it will also display current date. Crave WordPress Theme is made for Genesis framework, the well known framework is popular because of its ready to use design where all the features and layouts can be managed in simple way. Because of colorful style the sidebar looks more attractive with it’s colorful background, the color style shown in the demo can be chanced from the options page. There are three color schemes and layout options attached with the template. Featured images are also supported to create enhancing look for the higher number of page-views. Epik is a sleek and modern responsive WordPress theme ideal for web start-ups, mobile apps, web apps, businesses, bloggers, and portfolios. The flexible, multipurpose premium theme would also suit any other type of website wanting a professional, trendy, minimalist and flat design. The Epik theme is mobile ready with a responsive design that will fit any screen size. The layout automatically adjusts to display perfectly on desktops, tablets, phones and all other mobile devices. 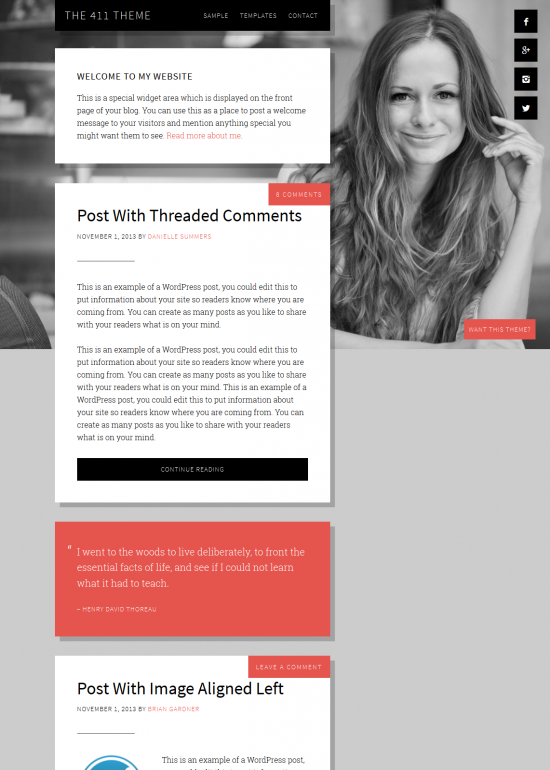 Metro Theme by StudioPress is a widget ready WordPress magazine Theme and blog child theme work on Genesis Framework. Metro Pro theme structure is constructed using 1152 px which is a perfect size to support any screen resolution in my opinion. The theme has flexible homepage hence no tough setup process is involved to design a custom news sharing website. To be true let me say that only dragging and dropping some widgets and content implementation is all that needs to be completed from your end. The theme comes with total twelve type of widgets to power-up sidebar and different sections of homepage. The ready to use template will easily start working after setup on the server. After purchase you just have to upload it from Appearance menu displayed on the sidebar. Quattro by StudioPress is a vintage styled Genesis child theme for personal and professional blogs, featuring a responsive design. A theme with a responsive design will adapt the presentation of the web page to the screen of the device used by the visitor; be it a desktop, a laptop, a tablet or a smartphone. Hence, such a theme responds to the size and orientation of the screen. 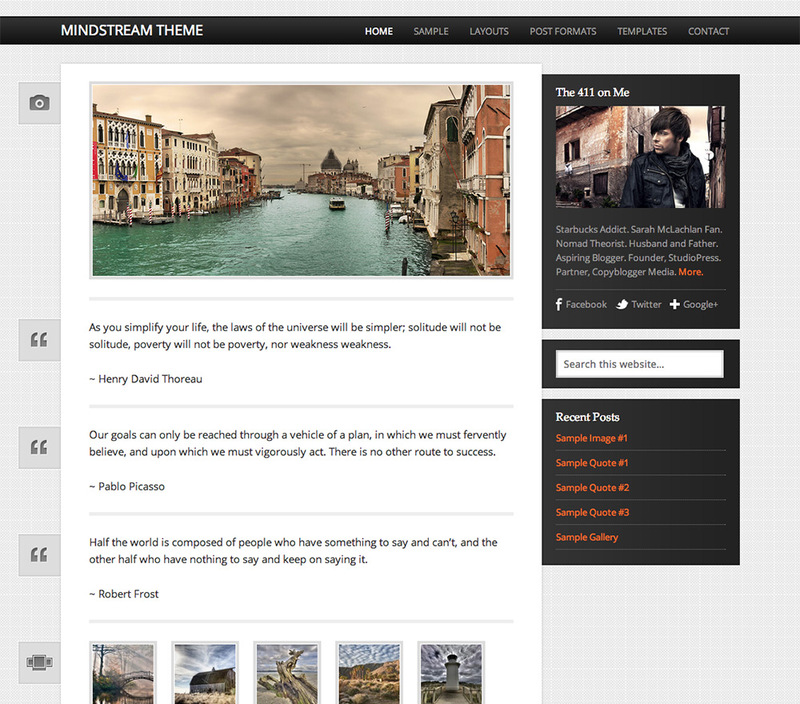 Mindstream Responsive Genesis Theme Mindstream by StudioPress is a responsive Genesis child theme for professional and personal blogs supporting WordPress post formats offering Tumblr-like post features. Themes with a responsive layout will adapt the presentation of the web page to the screen of the device used by the visitor, be it a desktop, a laptop, a tablet or a smartphone. These themes respond to screen size and orientation of that screen. 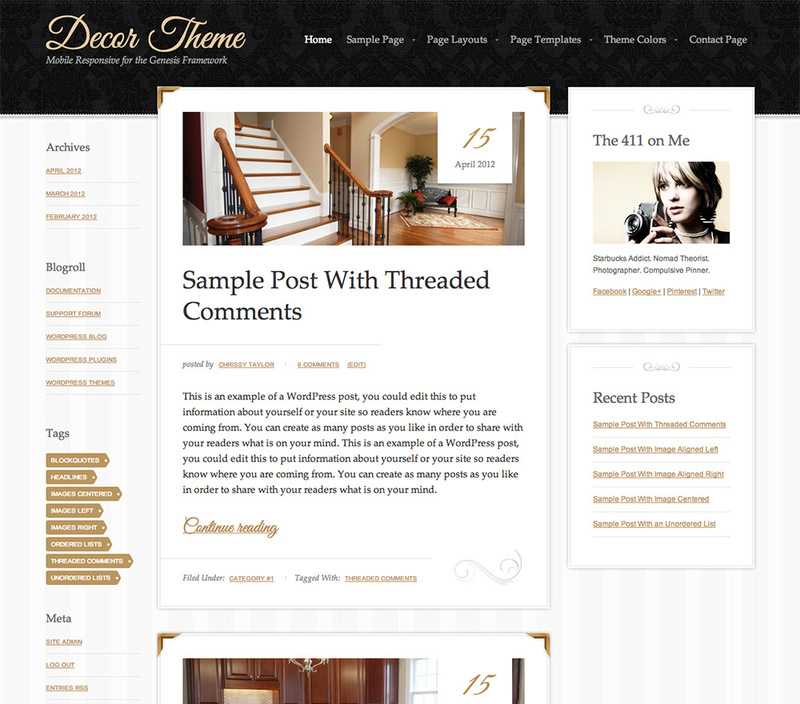 Decor is a sophisticated looking blog theme from StudioPress. It has a responsive layout and uses the Genesis framework (included). By default, its layout is extra wide to allow for a sidebar on each side of the main content. For smaller screens (going all the way down to mobile phones), the sidebar content is moved to show beneath the main content. Decor is a WordPress theme to consider for bloggers who want an elegant design — perhaps even interior designers. (in)SPYR is responsive premium wordpress Genesis Framework child theme from Studiopress, (in)SPYR theme created with diversity in mind, can be used fashion business websites. And which builds 3 distinct styles, 6 color skins, 3 layout options, responsive design layout, custom subscribe widget, social icon shortcode, custom theme options panel and more. Balance WordPress Theme by StudioPress is clean and professional child WP theme works on Genesis Framework. Balance Theme is perfect solution for those who wish to start clean and minimal blog for their business or you can start product review or technology blog to share information in simple yet impressive way. The template has super cool email signup box on the top right area to grab email from the subscribers, and it can lead to generate good client base for future. It is based on clutter-less design that will help you arrange information properly. Focus is a premium WordPress child theme for the Genesis Theme Framework from StudioPress. The simple and clean theme is designed to focus visitor’s attention on what matters – your words, pictures and videos. 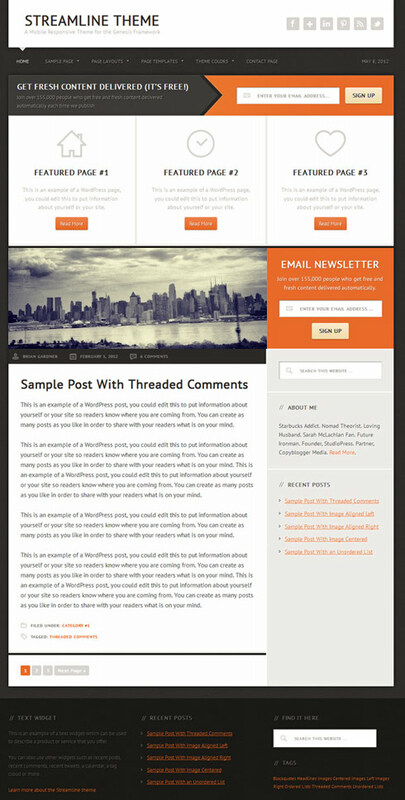 Eleven40 WordPress Theme is a clean WP theme for any bloggers from StudioPress and works on Genesis Framework. Eleven40 is designed to present your content in professional and unique way. That’s the reason it is useful for content friendly magazine website or personal blog where content is everything. With large space it can accommodate huge content on homepage, that’s greatest benefit of the theme. It is smart enough to adjust with any mobile devices and adjust with any screen size. 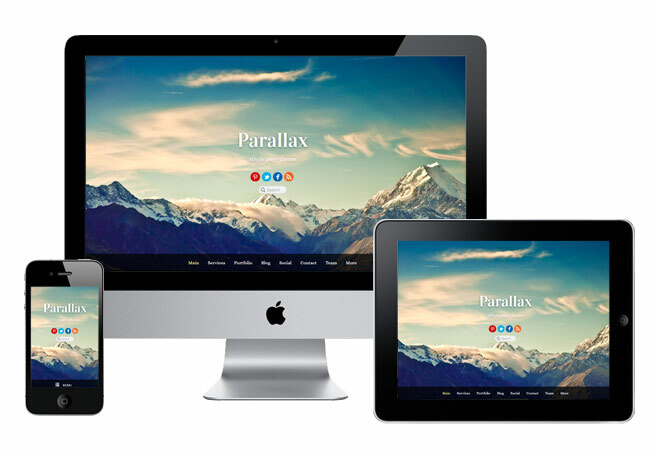 This is the only theme which cross 960px barrier, and supports 1140px width layout. Generate by StudioPress is a responsive Genesis child theme created to support bloggers and online marketers to grow their e-mail list. A theme with a responsive design will adapt the presentation of the web page to the screen of the device used by the visitor; be it a desktop, a laptop, a tablet or a smartphone. Hence, such a theme responds to the size and orientation of the screen. 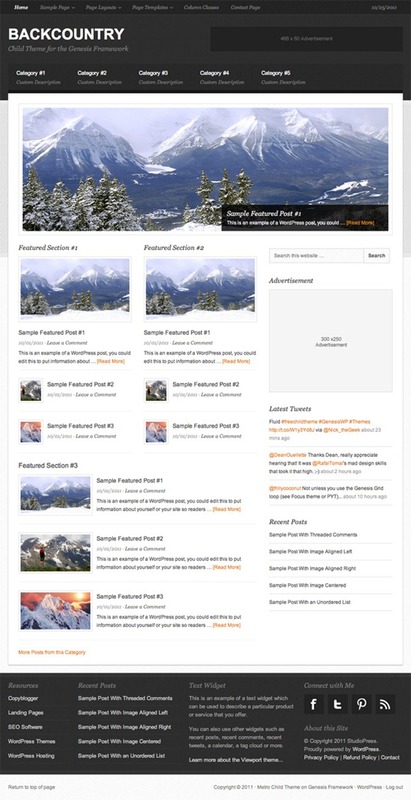 Backcountry Premium WordPress Theme is a versatile theme that works great for lifestyle and business websites. This flexible child theme from StudioPress gives you the canvass to build whatever site design you need. The theme’s overall layout is clean, streamlined and professional looking – must haves when setting up a corporate or business website. Like all Genesis themes, this child theme is customizable. This theme allows you to upload your own background image and header – perfect for projecting your brand image. You also have 6 layout options to choose from, a range of full width to 3 column options, a choice of 4 colors styles (blue, gray, green and red), footer widgets, and threaded comments. 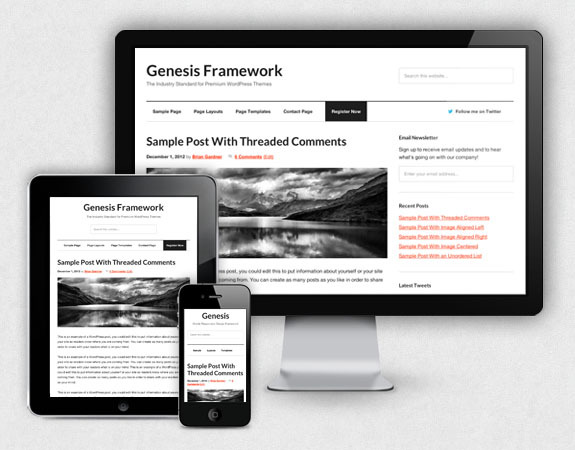 Earlier this month StudioPress released another great skin for the Genesis Framework. That new theme is the Scribble child theme. 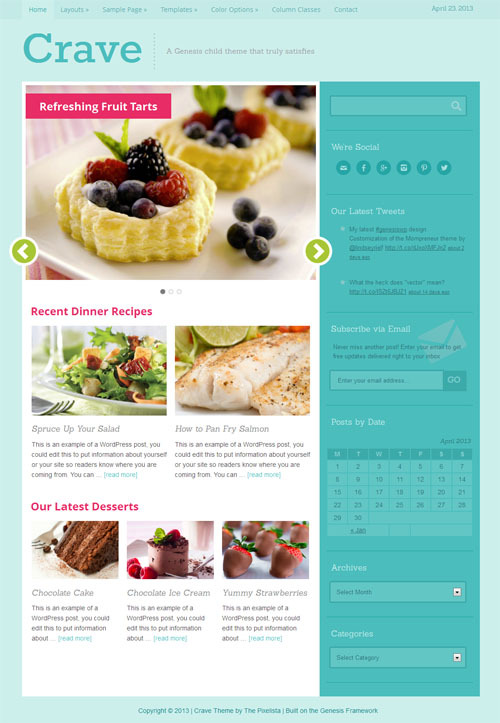 This theme has seven color styles (blue green, lavender, orange, pink, red, and teal), 3 layout options, custom header, feature images, fixed width, theme, and threaded comments. This skin has a classic look with a bit of flare to it. The Scribble theme provides you with a way for you to show off your photos, text and video. At first glance, the theme has a darkish feel to it, but after closer inspection it has just the right amount of color add the professional look and not such a darkish feel. The Associate WordPress theme is a design offered by StudioPress specifically for businesses to create a professional image. It includes a clean, modern and professional style that will represent any type of business well. With plenty of navigation options built right in and a customizable home page, the Associate is easy to personalize to meet your own business need. You will find that you are able to give just the right first impression with the Associate theme.The home page of the Associate is fully customizable. It includes a selection of navigation menu controls as well as widgetized areas. The featured section of the home page is eye catching and professional. You will easily be able to add images and text to the page. Adding multimedia content to the Associate theme is easy since they can be uploaded directly to WordPress and there is no need for a third party host. Fabric is new premium WordPress Theme for Home Decor from Studiopress, Fabric theme provides a rich, authentic and fresh foundation to weave all of your content through. 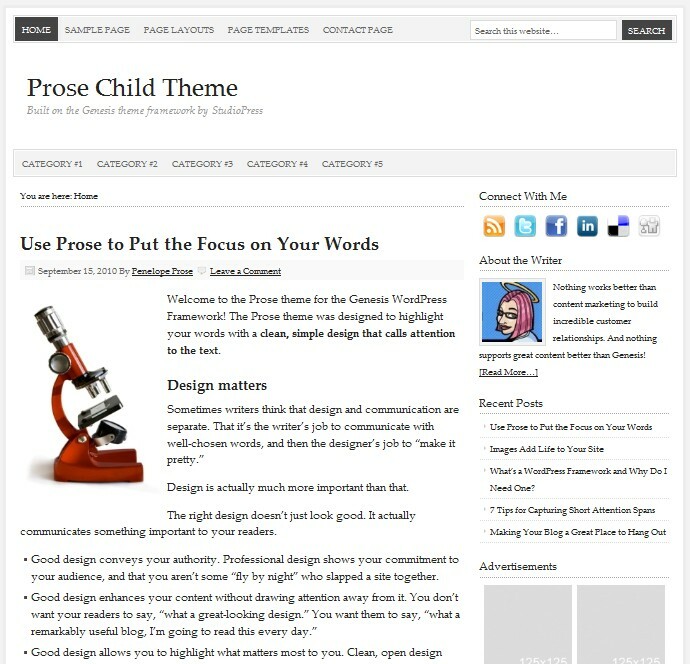 StudioPress Fabric child theme works on the genesis framework and includes the following features: 3 color styles, 3 layout options, featured images, fixed width, footer widgets, threaded comments. Minimum Pro of StudioPress is a business child WordPress Theme for Genesis framework with list of plenty of advanced features. It’s best for the business people looking for all in one advanced theme to add majority of data on the front-page, the theme let’s you choose what to present on homepage and also gives you layout to use for page and posts. Whether you have a big portfolio product list or want to add a blog with business site there will be complete support for all those needs. We have personally tested it for the responsive feature and found to be great working for tablet, iPad and smart phone screens. The slider and featured areas also respond to the touch and swipe functionality for the easy data browsing from touch pad devices. 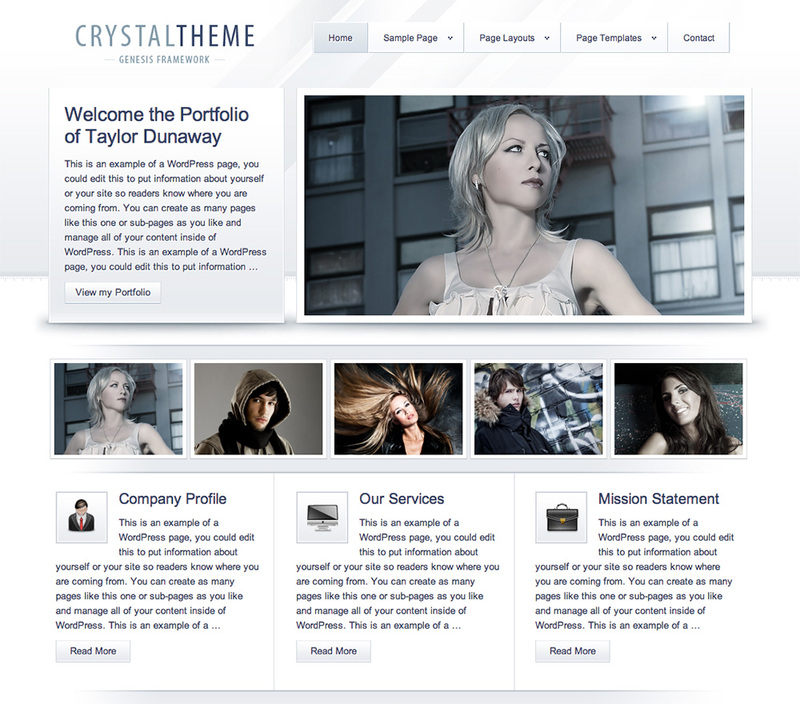 Crystal is a professional portfolio theme with an superbly classy design. This is ideal for showcasing photography. The homepage features a “welcome” area along side large photos that fade from one to the next. Below that are information boxes to inform potential clients about your services. 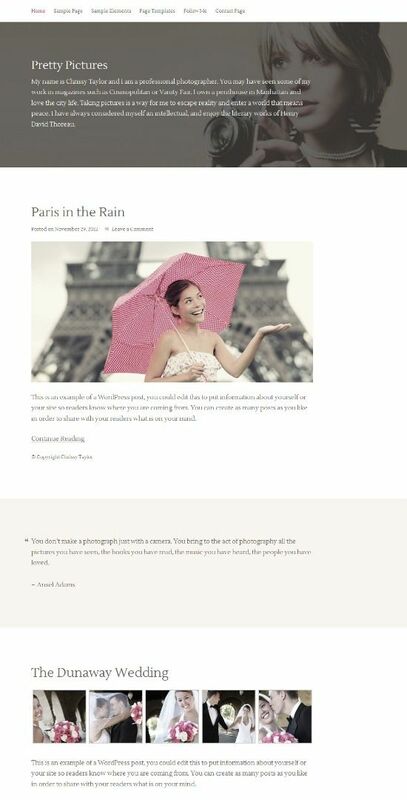 A portfolio page template is included that organizes your uploads into rows and columns. When clicked, a photo is presented in a larger format with the description you provide. All photos are automatically resized and cropped to fit perfectly. Manhattan is a premium child theme from StudioPress which works on Genesis Theme Framework. 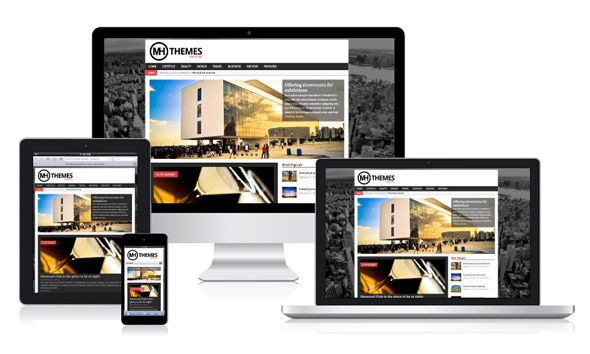 It is a multi-purpose theme which can be used to create portfolio, gallery, video, business or personal blog site. 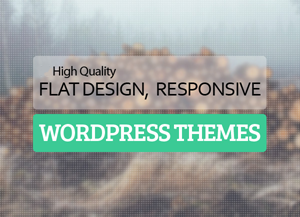 This theme is suitable to showcase your work or services to other easily. Manhattan child theme allows you to showcase your content in a professional way and it comes with features like 5 color schemes, comprehensive options panel and custom widgets that support everything from video to in-depth articles to photography. 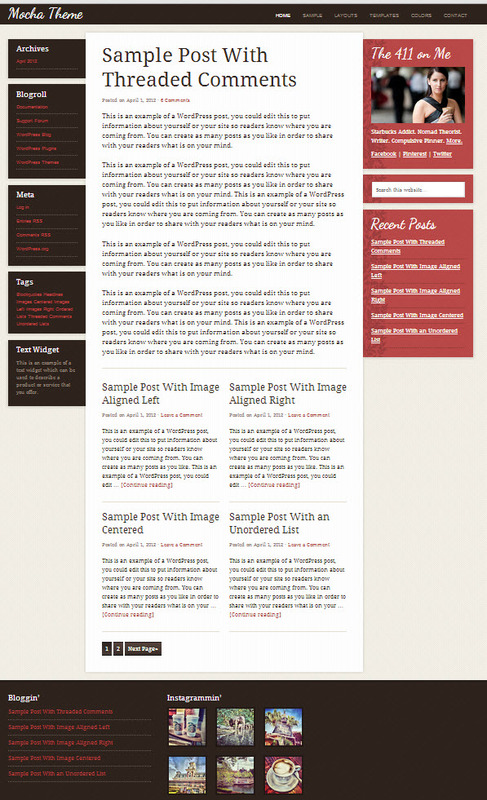 The Prose theme is designed to be easy to use and easy to read. The theme allows you to change many of the theme’s elements with point-and-click ease. If you can’t tell a section of site code from a supermarket bar code, you’ll still be able to use this site. It has a professional, clean design that makes it easy for you to start from a good position as you’re customizing your site. The Prose theme features fonts that are very easy on the eyes. The site is designed with writers in mind, so there is plenty of space to feature your content. 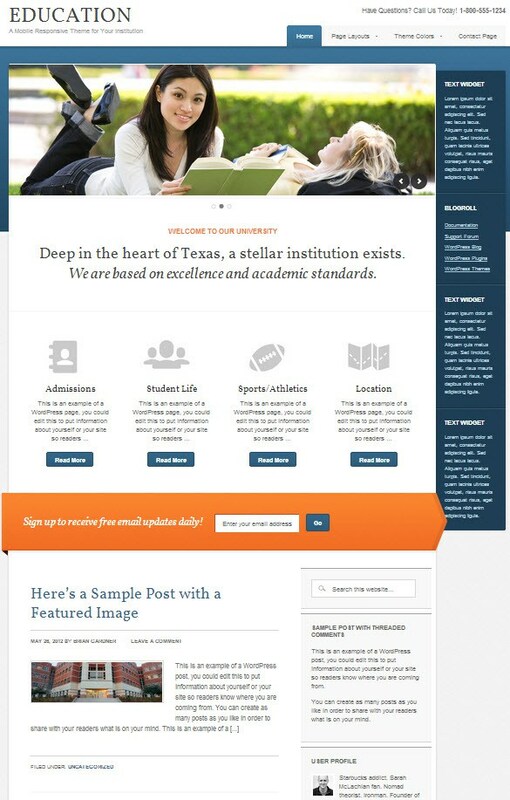 The theme is built on the Genesis framework, the parent theme of many of StudioPress’s offerings. This parent theme provides professional levels of functionality without requiring you to become a professional designer or programmer yourself. 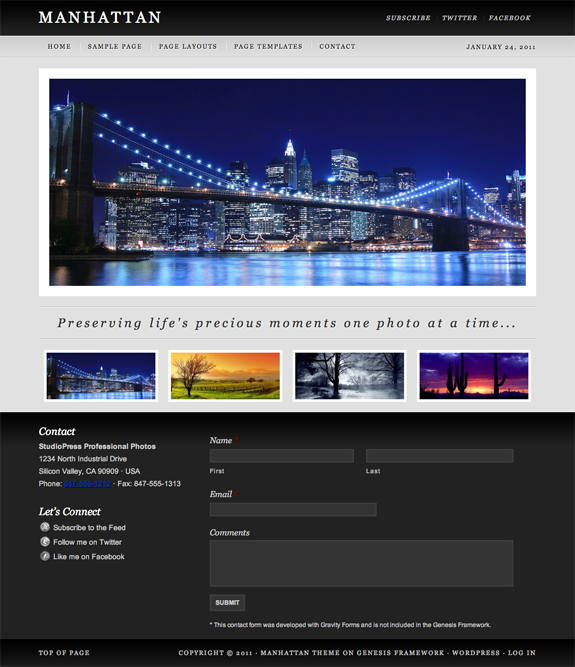 Expose Pro is a simple responsive and HTML5 ready photography WordPress theme for the Genesis Framework. The premium child theme from StudioPress has a clean and basic single column design and comes with 5 colour styles, custom header and background, threaded comments, HTML5 markup, a mobile responsive layout, theme options and all the other features of the Genesis Framework. 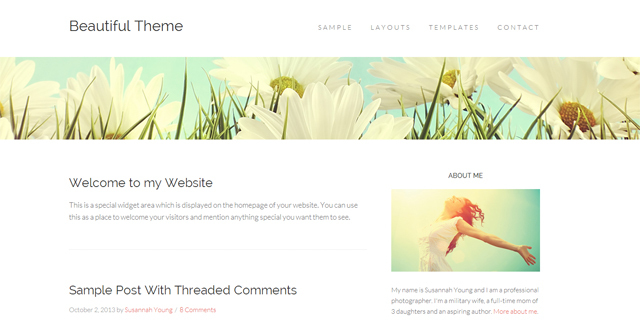 The Serenity WordPress theme is a soft, magazine style theme from StudioPress. It runs on the Genesis framework, which provides the backbone behind several of StudioPress’s offerings. The theme also provides flexible options in its own right, having a layout that is excellent for featuring both image and text content. Content including video can also be added to this site very easily. Serenity has several color schemes, all of them concentrating on soft hues. They can be changed by using the control panel features in the theme, meaning that you don’t have to touch a style sheet or other type of code to make such changes. You can also very easily change the theme around in terms of layout. The Genesis framework allows you to add and delete sidebars, or to move them around, to change the look and layout of your content. 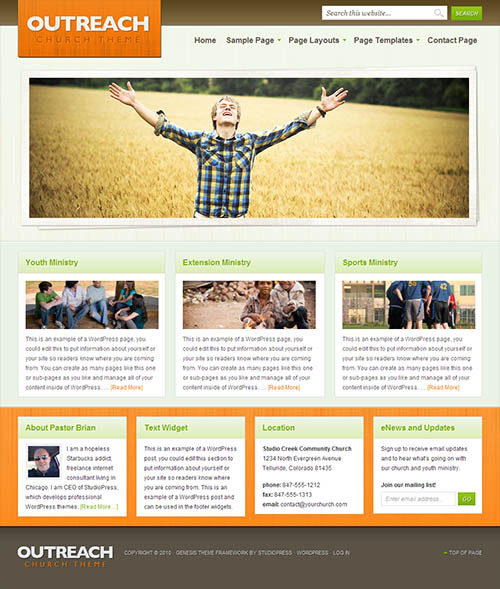 Outreach WordPress Theme by StudioPress is most popular child theme designed for church or ministry websites. Outreach Theme provides perfect framework to display valuable message from god’s house. Moreover it’s highly used for other business and personal websites, hence it’s multipurpose template that will work for any requirement. 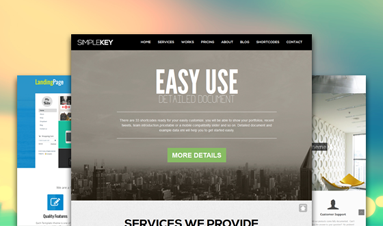 The theme allows you to display textured background to add more flash on overall presentation. The theme works on Genesis Framework that has most powerful structure. News Pro Theme by StudioPress is a genesis framework based premium magazine and news theme with revised platform. News Theme has several areas to add featured stories and latest news posts on the homepage using custom widgets. The writers will surely find it good enough to post their articles over elegant and quick loading web template. The related posts and updates displayed o the sidebar is best mode to keep visitors engaged over site. There is a wide banner spot on the header, this section is made with widget to placing adsense code or affiliate banner id is a matter of copy and paste. Apart from that you can manage advertisement for the wide-bar or select option to be displayed on to the post from the advertisement dashboard. Mocha is a contemporary, sleek theme from StudioPress. 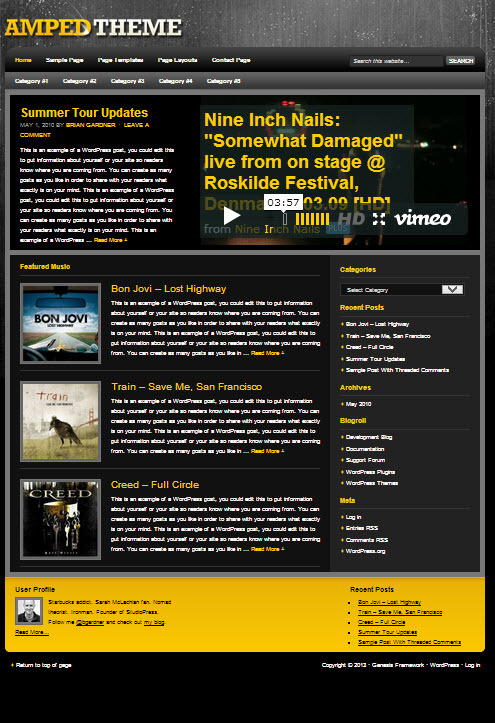 The theme’s layout and design considerations make it a good choice for blogs that feature music or other arts. It would also work well for sites about contemporary culture or trendy subjects. The theme features a very classy use of space. The text is very bold and legible and makes it easy for people to read your content without straining their eyes. The Mocha theme is a child theme for the Genesis framework. Genesis provides the muscle behind the site and it is considerable. 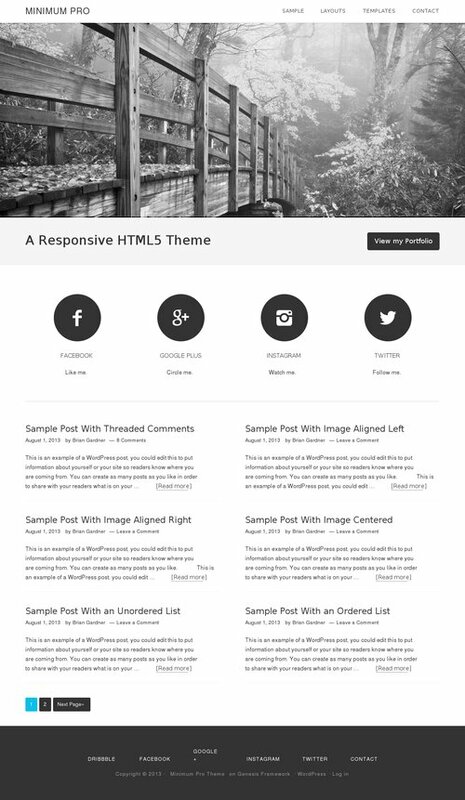 This theme comes with a great layout, but it’s easy to alter it with the Genesis framework. 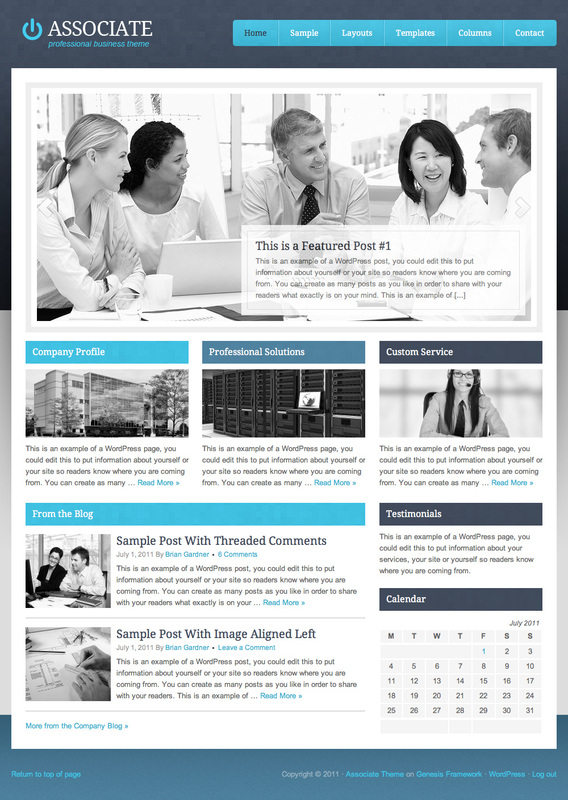 The Metric WordPress theme is clean and professional looking. It has an obvious appeal to those creating an online presence for their business. The site features good use of space on the homepage and the content pages can be changed very easily, without having to touch a line of code. 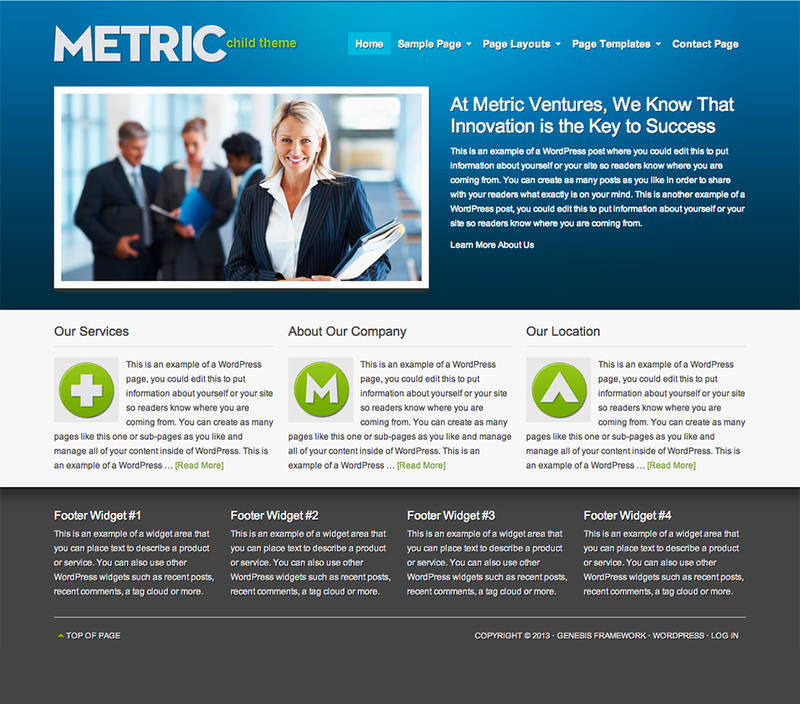 The Metric theme features a bold top section with a large spot set aside for an image. The page’s second horizontal section holds three image and text spots that can be used for other content. Below that, the footer has plenty of room for widgets. This theme is ready for widgets on arrival and there’s nothing to configure in the theme to get them working. 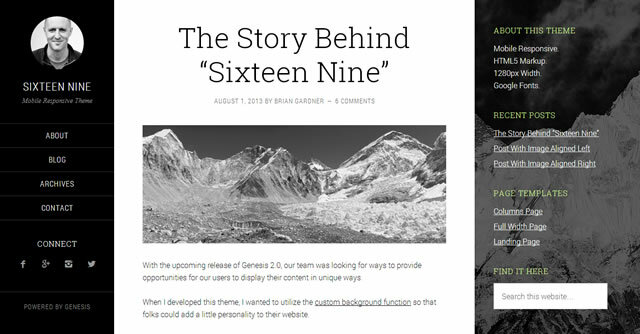 The Magazine theme by StudioPress is based on their powerful Genesis framework. It is among the many child themes available for this framework. It may be purchased alone or as part of a discounted package that includes all of the StuidoPress themes. The Magazine theme offers exactly what the name implies. This theme would be well suited to a news magazine. The theme has plenty of space on the front page for images and text, with tabbed sections, dropdown list navigation and widget-ready sidebars. StudioPress specializes in turnkey themes for professional sites and this theme should suit anyone opening a news magazine site. 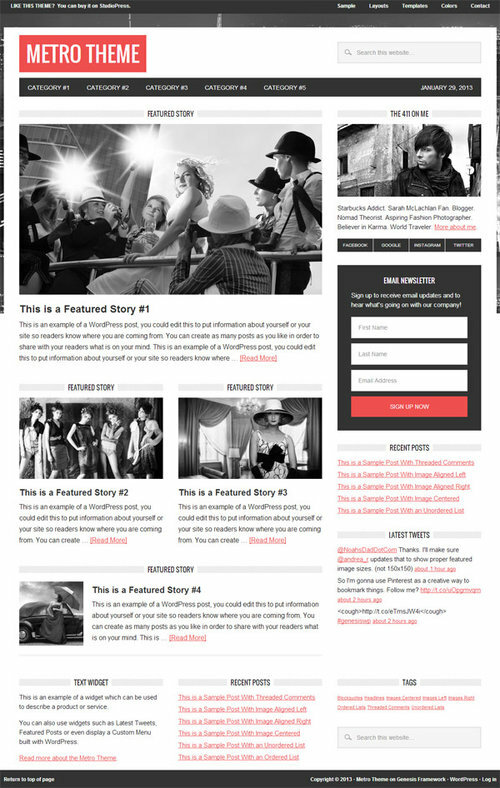 Lifestyle WordPress Theme from StudioPress is popular magazine WordPress theme for Genesis Theme Framework. LifeStyle theme cab be used for magazine website or personal blog requirements.The template offers different features like navigation control menu with drop down facility, dynamic Text / Image Logo option,SEO options, slider on the front page, theme optional panel and more. 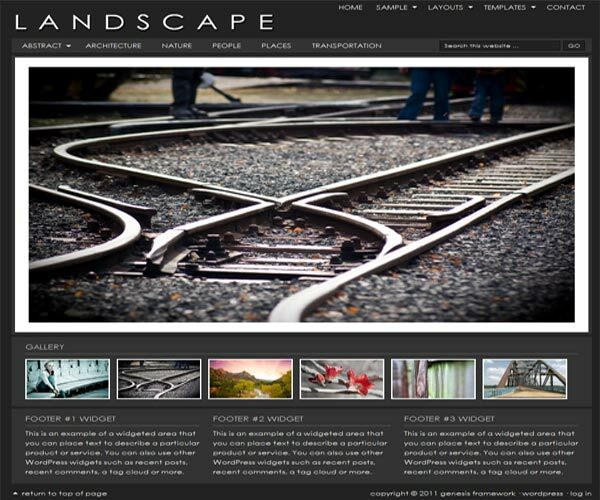 Landscape is a fairly straightforward and classic WordPress theme designed for photographers. Like many of the most popular photography website templates out there, it’s got a single large showcase image on the home page. There are some strong points and weak points to this theme. On the strong side, it’s built on the Genesis framework by StudioPress. Genesis is one of the dominant WordPress theme frameworks. It’s extremely well developed and stable. It’s used by a lot of big players. 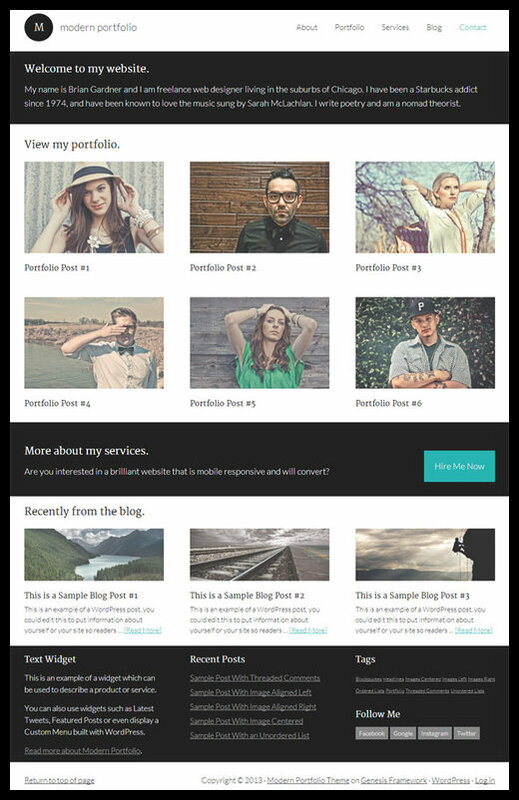 If you go with this option, you know you are getting one well-built photo WordPress theme. Going Green Pro WordPress Theme is a premium multipurpose genesis child theme by StudioPress. Going Green Pro Theme is best choice to create website for health niche, nature related topics or simple professional blog. The theme comes with color choices relevant to natural look which creates feeling of peace and calm. The clean background on text area makes better readable structure which is a good news for bloggers and content powered websites. It also looks fine with multi-media contents like images, videos etc. 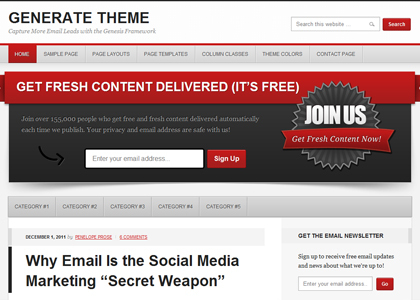 The theme shows attractive email newsletter widget at the top of front-page to build a large collection of emails list. Freelance is a premium child theme from StudioPress. 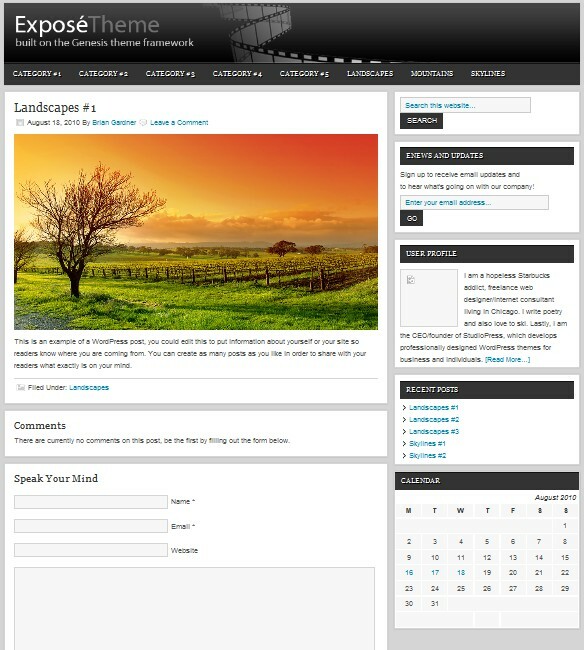 This theme works on Genesis Theme Framework and can be downloaded from here. When you’ve got enough to do with building and marketing your business, the you shouldn’t have to worry about your website as Freelance fulfill your needs and requirements. The best thing I like about this is that it places a strong, professional face on your business, so you can get back to work without worrying about layout and design of your website. In addition to this, you can use this theme with BuddyPress too, all you need is GenesisConnect WordPress Plugin. Executive WordPress Theme by StudioPress is one of the most popular business child theme mainly focused on professional look. Executive Theme is developed with goal to share your main projects and expertise on front-page with smart strategy to target more customers. The elegant design of the template provides great experience to your visitors and clients by displaying your main objectives and business message with call to action button right on the front-page. 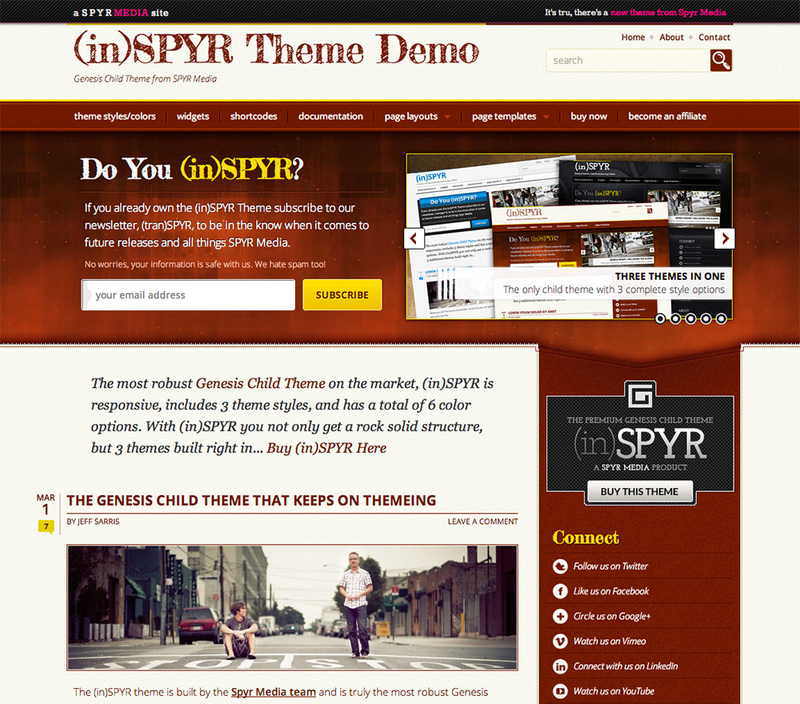 The child theme works with Genesis Framework to provide you with the powerful platform. Enterprise Pro by StudioPress is a responsive Genesis child theme for business websites, featuring a widgetized homepage and additional promotional space between the post and comments area. 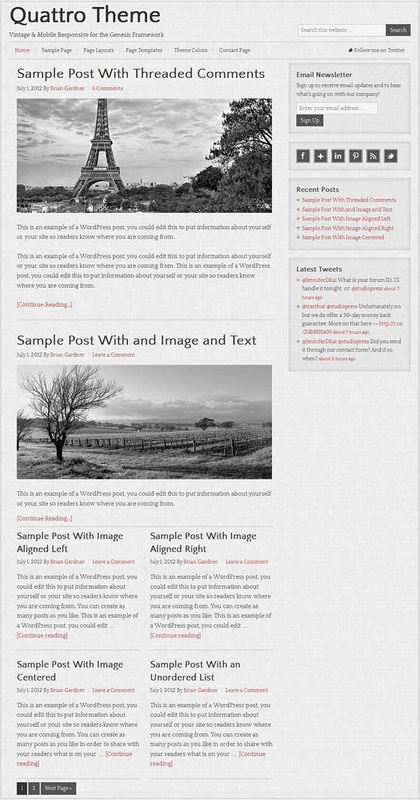 The theme supports natively two WordPress 3 menus. By default both navigation menus are left aligned and located below the header. Another option is adding a custom menu to the Header Right widget area which will display the navigation of your choice in the header. Education is the eleventh Genesis theme to be mobile responsive and it carries all the suave sophistication that hint of the input from one of the most creative WordPress theme designers in the business, Rafal Tomal. Clean lines, cool fonts and those dashes of detail that help make a theme special. If you want to see this theme in all its glory then head over to the Studiopress website and take Education for a spin. Corporate is a premium child theme from StudioPress which works on Genesis Theme Framework. it is corporate-style WordPress Theme which is specifically designed for small to medium business website and offers you a unique way to showcase your company, services and what you offer. 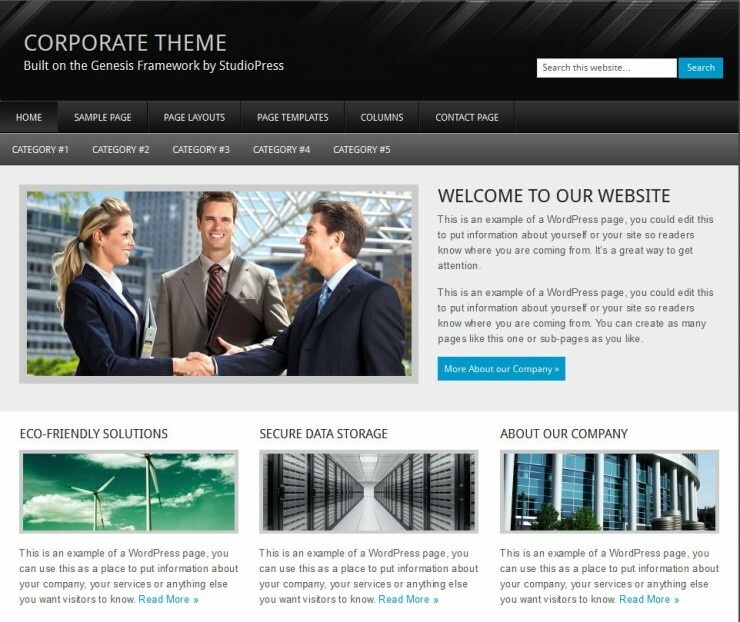 Corporate WordPress theme comes with features like custom background/header, 6 layout options, fixed width, featured images, threaded comments, multiple posts/page layout options, navigation menu controls, backend options panel and many more. 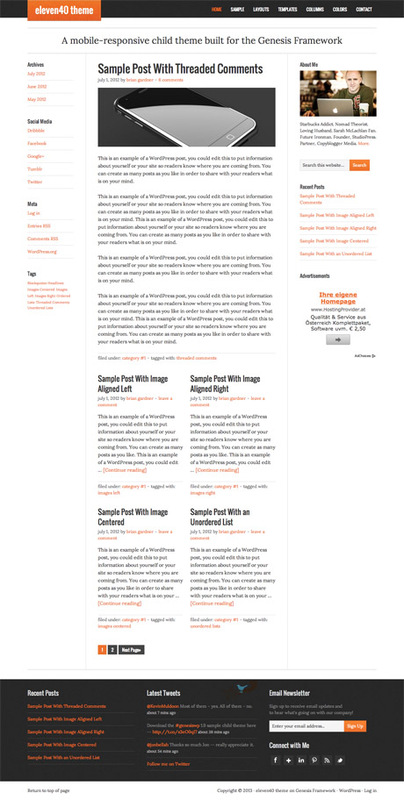 The Amped WordPress theme is a child theme that works with the StudioPress Genesis framework. 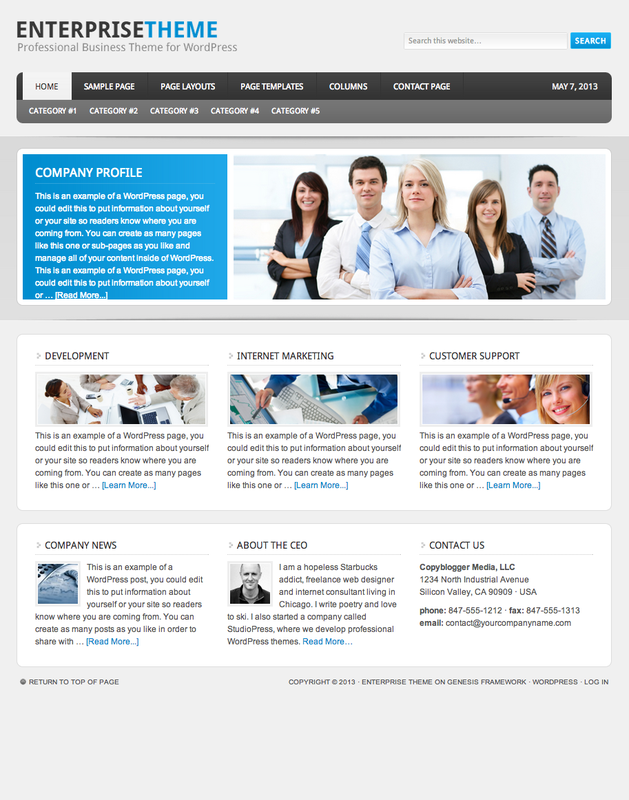 The theme features a sleek, modern design that emphasizes dramatic colors and its black background. While the theme is intriguing on its own design merits, the Genesis framework is the real centerpiece of all of the StudioPress offerings. AgentPress premium WordPress real estate theme from StudioPress. 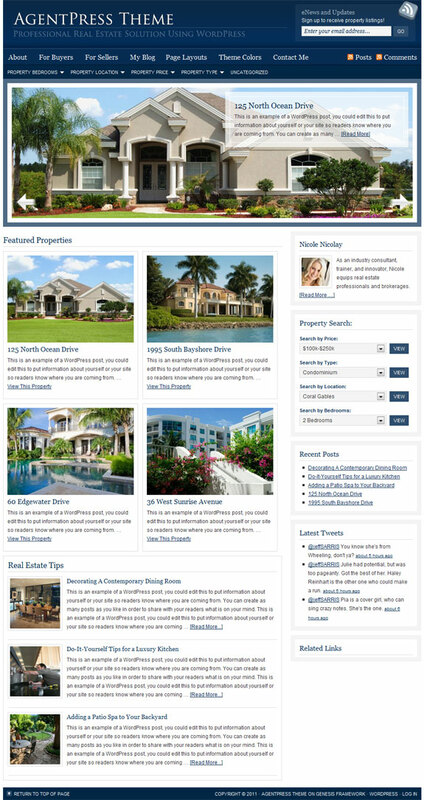 The theme includes multiple page templates, custom features and plugins that can be used to create a complete, fully functional real estate website. The theme works on the Genesis Framework and includes 5 colour styles, IDX integration, slider, property search box, featured listings, community pages, integrated blog and more. 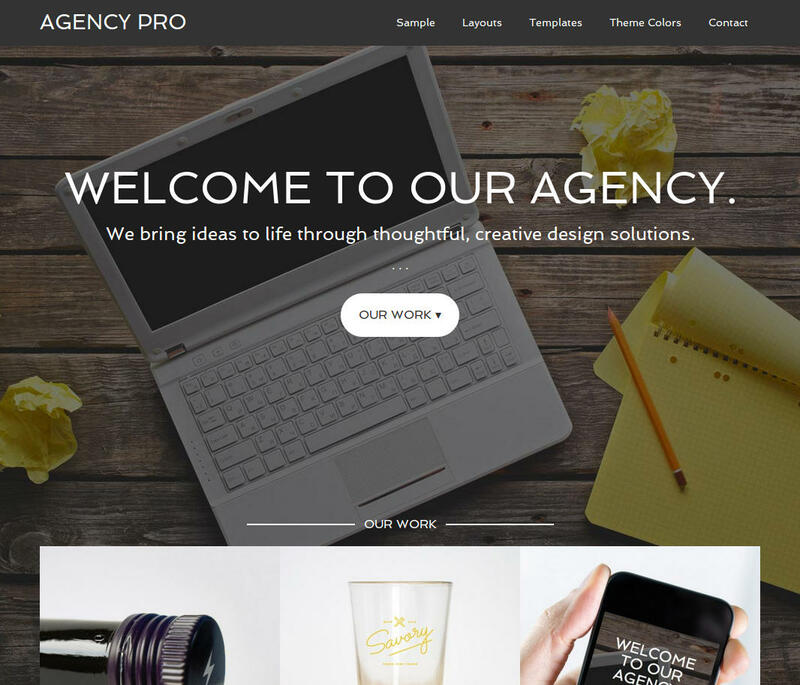 Agency Pro by StudioPress is a business WordPress child theme made for Genesis framework. Agency theme is made in corporate style look, so that individual business dealing with corporate sector or professional service sector can target more leads. Content and look both are necessary for any business site, first of all a business site should be able to display company product, work background, profile and all the necessary details in clear way. Second important thing design, if all these information modules are not placed in clear and better way then user might leave website with negative impact. It comes with big bunch of ready features to customize website without changing a single line of code manually, even a common business user having basic WP knowledge can setup their own website and manage all customization tasks easily. 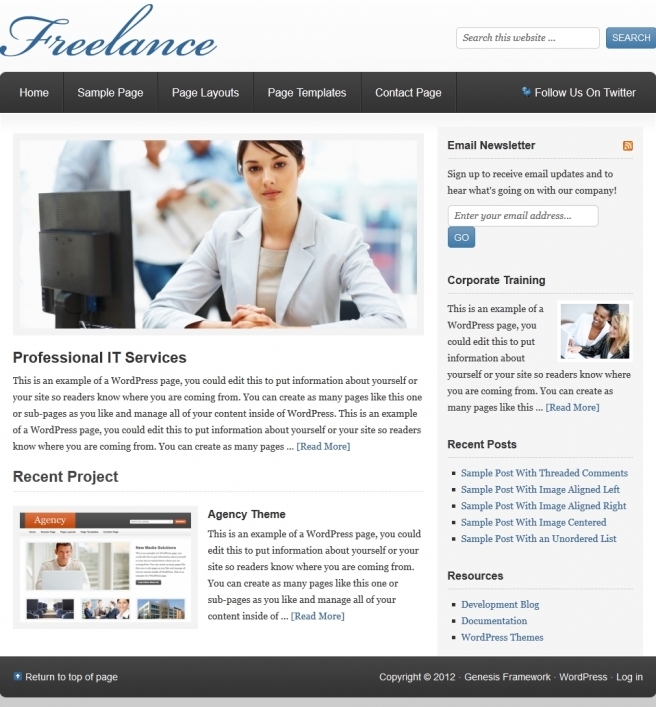 Great WordPress Themes Proudly Powered by WordPress. It will good platform for you. We look forward to assisting you. If there is anything else we can do for you, please don’t hesitate to let us know!